The Itty Bitty Kitty Committee: That Tail! That Belly!! Here's a darling picture of Louie (now known as Albus) that his mama, Jessica, just sent over. His belly and orange tail are just sublime. Things are going so great for Louie. He and brother Bruce are having so much fun romping about. And Louie loves playing fetch! That is news to me. Bruce must of taught him that trick. Or maybe Jessica! I'm rushing to get the kitten room prepared for our soon-to-arrive kittens. I won't promise, but will try my best to post a picture or two of members of the new brood - it all depends on how the day unfolds. Yesterday was a killer. All those flowers in the background of the pictures of Charlene posted yesterday had to be delivered. That project put my hopelessly behind, and I have to get a heap of things crossed off my to-do list before the day is out. If time allows for another post, I'll do it. We have a Flame Point and always joke that her tail belongs to another cat because it's so orange and stripey! Just like little Louie's. What a cute little nugget. I have a 9-week-old flame point foster who I am ridiculously in love with. We're coming up on adoption time and I am just dreading letting him go. Never known him to fetch, but he is the sparkle ball king of the foster room. What a sweet little pointy tail Albus has! I'm marveling at its angle. Albus is a lovely name for a mostly white cat. Love the tail! But I just realized it seems quite short...is that a siamese trait or something? Our boys fetch too! Chai has been doing it for all of his 5 years but his brother Mocha just decided to start recently - I think he's jealous of the oohs and ahhs Chai gets. ;-) Maybe Albus learned from Bruce that this seriously impresses us humans and he better start too. Ohhhhh I want to nuzzle that chubby little belly! His tail makes him look like a rat, or maybe a shrimp! Both of our cats used to fetch but gave it up when they turned about three years old. Hopefully Albus will never stop playing fetch. Great photo, and I'm glad to hear the kitten formerly known as Louie has settled in so well! Looks like he is a carrot-bottom rather than a carrot-top! Cute stripey tail, oh my cod!!! ANd the belly too!! so plump! So Professor Albus D., are you scrying there in the bath tub!? Cute cute cute stripey tail!! sweetheart, HOW did you get that TAIL??? Whether you call him Albus or whether you still think of him by his former name, Louie, this is still possibly the cutest kitten in the history of kittens! Albus, you're such a smart boy, it's no surprise you've learned to play fetch already. You just keep on surprising your mom with how adorable you are! 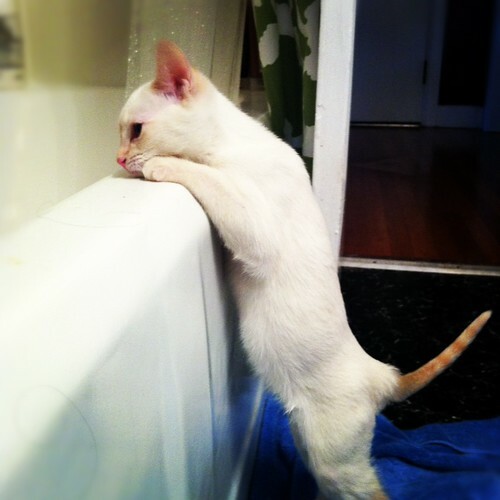 Albus\Louie has a whole new world to explore and he is doing his usual adorable great job! His tail looks JUST like a steamed shrimp! I love it!